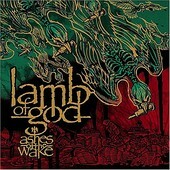 Quite possibly the most anticipated metal release of 2004, West Virginia's native sons Lamb of God come blasting out of the gate on Ashes of the Wake, the quintet's latest release and major label debut. Don't fret, metal people: this juggernaut hasn't gotten soft because they're now backed by a big budget. In fact, from the scorching opener "Laid to Rest", the second wave of American thrash metal has commenced, as the searing dual guitars and incessant pulsating rhythms, backed by the hellacious screams by Randy Blythe, have gotten meaner, tougher, and above all, carry the kind of impact that Pantera unleashed on Vulgar Display of Power and Killswitch recently unfurled on The End of Heartache. Showcasing massive power grooves personified by the old school feel of tracks like "Break You" and "Now You've Got Something to Die For", Lamb of God haven't turned the metal world upside down, but instead have reminded the genre what was missing and have prepared the fans for some of the most uncompromisingly brutal music found anywhere.